ZHEJIANG, China (China Aid) — Public outcry broke out against the government-backed persecution of Christians after officials failed to demolish a church in China’s coastal Zhejiang province on Monday. 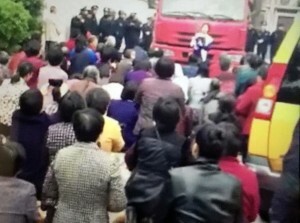 When Christians from Yingmochen Church, a house church in Ningbo, Zhejiang, heard that authorities had ordered the demolition of their church building on April 18, they rushed to the scene to pray and sing Christian songs. An estimated 100 church members showed up and successfully deterred the demolition team from carrying out their plan.